Fair questions I guess. Anybody who is not a runner and even people who are runners seem to think there is a natural progression. You start out running 5K’s then 10K’s then progress to a half marathon (13.1 Miles) and then the ultimate, a full marathon (26.2 miles). Isn’t that’s what expected? Well then, am I going to run a marathon? Go to a race sometime. You’ll see those elite runners, long strides, slim, running effortlessly, just gliding along, so graceful. Well guess what, they ain’t me! I’m way back (or way, way back) in the middle of the pack, hardly the picture of an elite athlete. And you know why? Because I’m not an elite athlete. I’m just an average joe with very little athletic ability. I’m never going to get any faster (in fact I’m going in the opposite direction). If you ever saw me play any sport (golf, hockey, tennis, basketball etc.) you’d know what I mean. I always struggle to get out the door, most of the time it’s really a struggle to get in the miles, I’ll never be the best, the leader of the pack. But, guess what. I’m never going to quit. Why not? 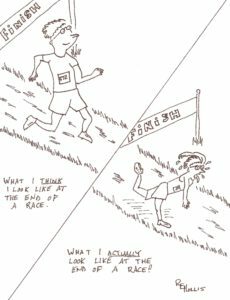 Why do I run? Because I can, for the joy of it, for the fresh air, the feeling afterwards, better health, resiliency, perspective, serenity etc. So if you see me out there on the path sometime you can smile and say ‘there goes an average joe” and if you are interested, please join me. I always enjoy company. Like that you emphasize you don’t have to be a race champion to become a runner!